The IT & high-tech industries have made a hot mess of dress codes. Thanks to folks like Steve Jobs, jeans and a T have become standard attire for many development shops; swap that T for a button up flannel and you’re ready for that big presentation meeting! But for an interview? Be careful. While Microsoft may be notorious for judging candidates for being overdressed at their interviews, MOST businesses do not follow this doctrine. At an interview, you need to be presentable. As we’ve mentioned before, your interview is your chance to market & present the best version of yourself in order to land a new job. And to do so you want the appropriate packaging, i.e. attire. You want to simultaneously impress & show you can fit in with the company culture. 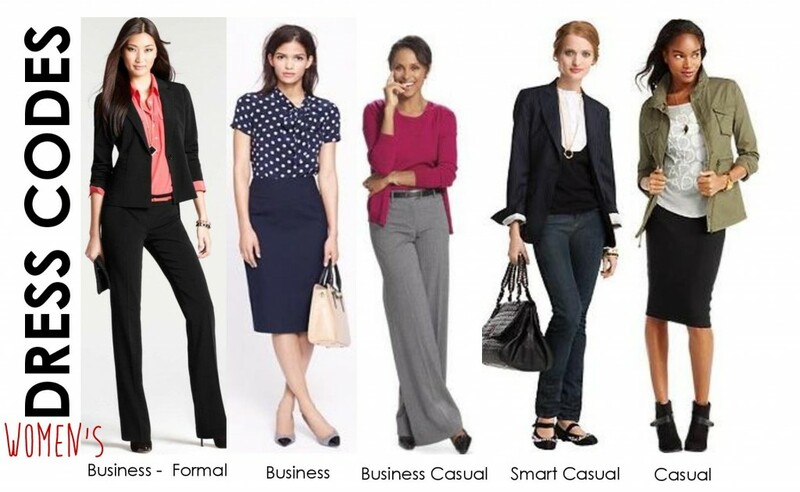 Before we jump into specifics, we wanted to give a quick look at what each dress code means. 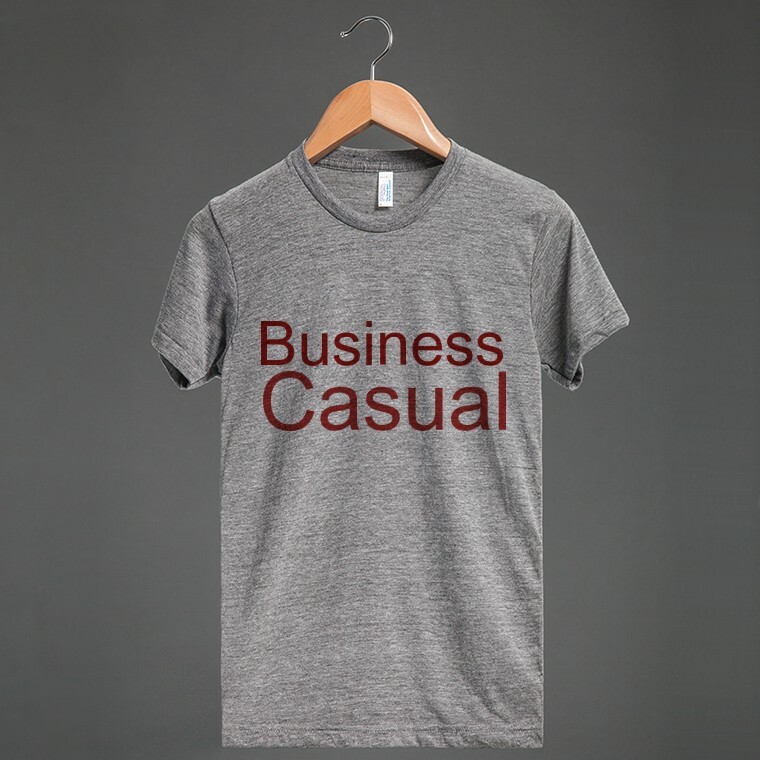 Names vary depending on who you ask, but the above titles (Business Formal, Business, Business Casual, Smart Casual, and Casual) should at least provide a good guideline and starting point. Business Formal = Suit …… It can be a three piece suit, standard slacks and a jacket, skirt suit, or dress suit. Colors tend to be darker (black, navy, charcoal). Fits well (i.e. not be too tight or too baggy), should have full length pants or a knee length skirt, and be worn with a button-up shirt + tie, or formal blouse. Worn with: dress shoes*. Business …… This is more standard “office attire”. On the bottom you should be wearing slacks or a tailored knee length skirt. On the top: a long-sleeved button up shirt+tie or dress blouse. You may also wear a sweater on top of your shirt if weather requires extra layers. If you’re wearing a tailored dress, you may pair it with a contrasting blazer atop, or blouse underneath. Also includes lighter colored & linen material suits. Worn with: dress shoes*. 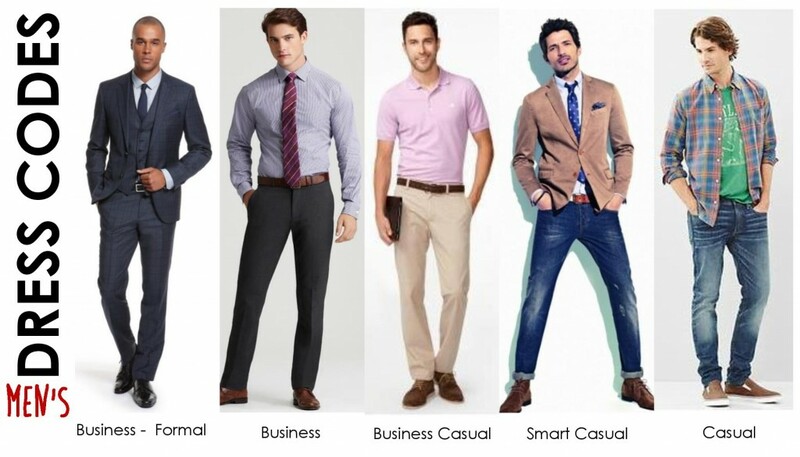 Business Casual …… For many technology companies & teams, this is about as formal as it gets. 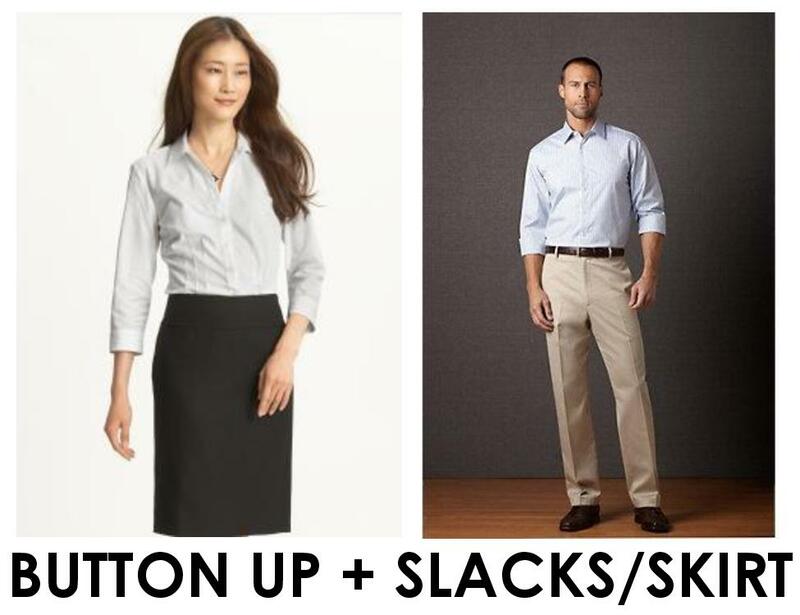 On the bottom you should be wearing: slacks, khakis, or knee-length skirt. 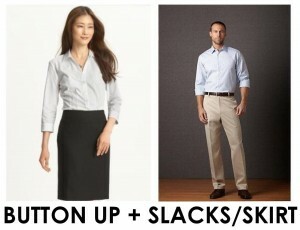 On the top: short or long sleeved button up (sans tie), polo, blouse, or sweater set. You may also wear a more tailored dress. Sweaters and cardigans work well for colder weather, as do more casual blazers. Worn with: closed toed shoes, preferably in leather or suede-like material*. Smart Casual …… This one is a bit tricky, and toes the line with business casual (hence why we tend to recommend sticking with business casual if you are unsure you’re in that ‘smart casual’ realm, just to be safe.) In this dress code, you pair a more casual item (jeans) with a more formal item (blazer). Basically the gist is: you look really polished. You may wear more casual materials, but they are all tailored and fit well. 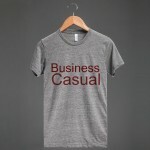 Casual = what you’d wear at home or on the weekend …… Jeans, a T and athletic shoes is pretty standard. In the work environment, some things will still be off limits (i.e. showing too much skin), but otherwise you’re free to wear what you want. *Note: we recommend women’s heels be kept between 1-3”h. A lot of work environments will fall somewhere in between two or three of these categories. Our own office tends to fall into business and business casual. Banking/financial and law companies historically have fallen on the more formal side of the spectrum. The key to dressing appropriately in your interview is to understand your options above + determine the dress code(s) of the company at which you are interviewing. Now that you have an idea of what folks wear there, work to match their style but with an increased level of polish. What does that mean? 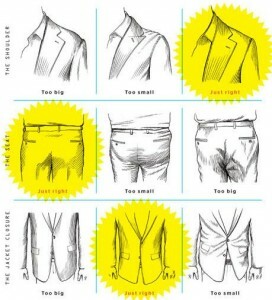 – If they wear slacks + shirts, add a tie or a blazer. – If they wear jeans+T, swap the T for a button-up. 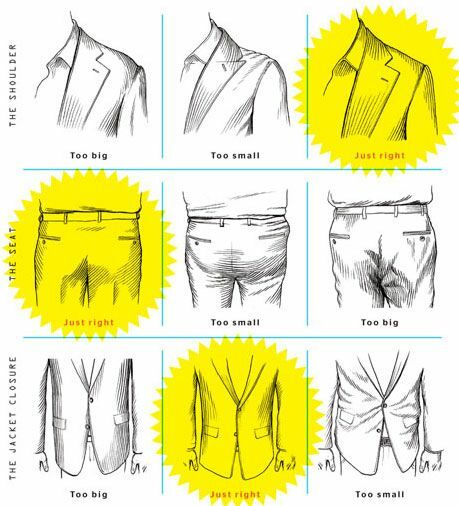 For anything you wear: Make sure it’s all clean, ironed, and fits well. And make sure not to show too much skin – spaghetti straps, low cut or unbuttoned tops, short skirts or shorts are all interview no-nos. Again, the goal is to fit the environment while also coming across as polished and presentable. This look is polished, simple and should be pretty versatile and appropriate for most IT-realm job interviews. To be even more prepared we recommend bringing a blazer, as well as a tie for men, with you to the interview location. You may end up leaving these items in your car, or tucking them into your briefcase, but at least you’ll be prepared should you notice a more formal dress environment than you anticipated. Yes, you should be thinking about this too. No, we don’t expect you to research our organization and how formal we are before coming in to meet with us. And yes, we are probably biased on this topic, but we do expect you to arrive dressed presentably. Slacks and a shirt work just fine for this occasion, but are not required. It really depends on the role and type of company you are looking for. A good rule of thumb: use your go-to interview attire, haircut, etc. Then the recruiter can give you input on what changes might improve your chances at any particular client. Don’t assume you can be casual – a recruiter is likely to determine you’re not a cultural fit for a client if your appearance in the interview doesn’t approach client standards. A few last thoughts (yes we have a lot to say on the subject! ): Go easy on accessories, jewels, make-up, cologne and perfume. While an outfit can be enhanced by details, a little goes a long way.